The debate over migration is plagued by a variety of inaccuracies and misunderstandings - on both the right and the left. Here is what the research really shows. Migration was the issue of the year in 2016 and it will likely remain important in 2017. The topic is, however, just as hotly debated as it is poorly understood. The so-called "refugee crisis" in Europe and the omnipresent images of overfilled boats arriving on Mediterranean shores give the impression that migration is threatening to spin out of control and that radical action is needed to curtail the uncontrollable influx of migrants. The fear of mass migration has fueled the rise of extreme nationalist parties throughout Europe and helped Donald Trump win the presidential election in the U.S. This call for tougher migration policies is juxtaposed by another, albeit somewhat weaker, opinion voiced by the business sector, human rights and religious organizations and left-liberal parties. They argue that migration tends to be beneficial for both origin and destination societies, and that we should not see refugees as a burden but as a potential resource. But in this polarized debate, the rather more sobering facts unfortunately get lost. Both the left-wing and right-wing narratives on migration are rooted in a series of myths that reveal a striking lack of knowledge about the nature, causes and consequences of migration processes. This text examines eight of the myths that I have often encountered in my research. It isn't quite as easy as simply slamming the door shut. Migration restrictions can have several unintended side-effects which may undermine their effectiveness. First, restrictions can compel migrants to find other legal or illegal channels - the use of family reunification channels by de facto economic migrants, for example. Second, strict border controls often divert migration flows through other terrestrial and maritime routes, thereby increasing the market for smugglers. Third, restrictions can lead to surges of "now-or-never" migration. When Suriname became independent from the Netherlands in 1975, for example, about 40 percent of its population migrated to Holland before visas were introduced. Finally, restrictions tend to interrupt circulation and push migrants into permanent settlement. This is what happened, for instance, with the so-called "guest-workers" in the 1970s and '80s. Fearful that they would not be able to re-immigrate after a temporary return home, many opted for permanent settlement. Prior to 1991, when movement was free, many Moroccans travelled back-and-forth to Spain as seasonal and temporary workers, but the introduction of visa requirements in 1991, as a consequence of the Schengen Agreement, set in motion the phenomenon of illegal boat migration and triggered permanent settlement of Moroccan laborers in Spain. They, in turn, brought over their families, leading to the rapid growth of the Moroccan population in the country to over 700,000. This does not mean that governments cannot or should not control migration. It rather shows that liberal immigration policies do not necessarily lead to mass migration and that ill-conceived migration policies can be counterproductive. Free migration is often strongly circulatory, as we see with migration within the EU. The more restrictive entry policies are, the more migrants want to stay. Such unintended effects create fundamental dilemmas for policymakers. Significant media attention on persistent boat migration and irregular border crossings have created a distorted and misleading image that migration policies are "broken" and borders are beyond control. The intense focus on the "refugee crisis" has hidden the fact that most migration policies are, in fact, quite effective. After all, the large majority of migrants - according to best available estimates, at least nine out of 10 - enter Europe legally, defying the idea of that migration is "out of control." As such, illegal migration is a relatively limited phenomenon. Periods of extremely high refugee migration, such as in 2015 or in the 1990s during the Balkan conflicts, are more the exception than the rule and tend not to last. Immigration is not a flow that can be turned on and off like a tap. Modern immigration policies aim to influence the selection and timing of migration rather than volumes of migration. We do, however, often overestimate what migration policies can achieve. This is because migration is driven by processes of economic development and social change - both in origin and destination societies - that lie beyond the reach of migration policies. 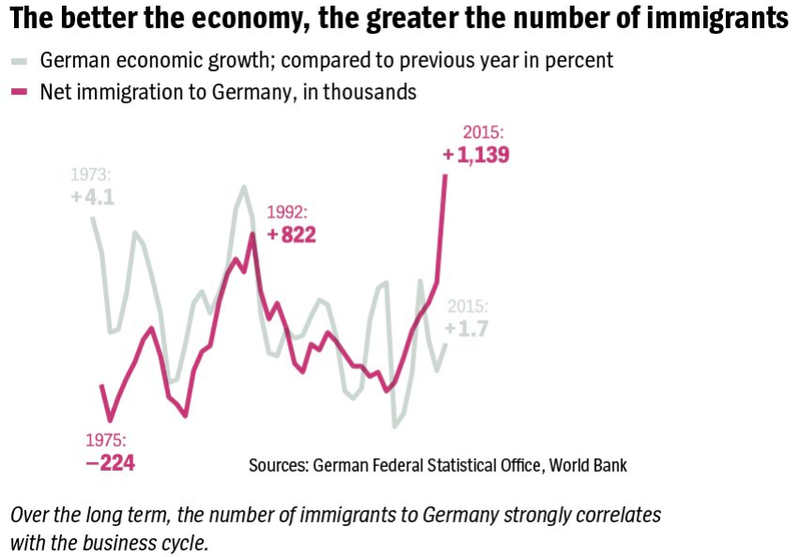 In most European countries, for instance, immigration levels tend to strongly correlate with business cycles (see the graph for the German case). In times of strong economic growth, more migrants are likely to find jobs and thus obtain work permits. Economic migration is strongly driven by labor demand, defying popular ideas that it is an uncontrolled phenomenon largely driven by poverty and violence in origin countries. This is what politicians may want us to believe, but the reality is more nuanced. For a recent study we conducted at the University of Oxford, we examined 6,500 migration laws in 45 countries between 1945 and 2010. We concluded that immigration policies have become more liberal for most migrant groups over the past decades. In Germany for instance, some 61 percent of all relevant regulations passed since 1945 had an alleviating effect, with 35 percent of a more restrictive nature and 4 percent neutral. The main exception to this rule are the eye-catching border controls and visa policies aimed at preventing asylum seekers and irregular migrants from entering European territory. These groups, however, only represent a minority of all immigrants. If we look at long-term trends in admission policies, most other migrant groups - including labor migrants, families and students - have been increasingly welcomed. Just 20 years ago, German and Dutch politicians frequently claimed that their countries were not "countries of immigration." Today, such voices have become the exception or have been relegated to the right-wing fringe. That too is an indication that migration has become increasingly accepted, despite rhetoric suggesting the contrary. 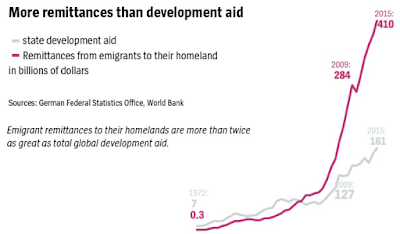 Many governments as well as development organisations see development aid as a tool to reduce migration. This view is based on the misleading idea that poverty and violence are the main drivers of south-north migration. 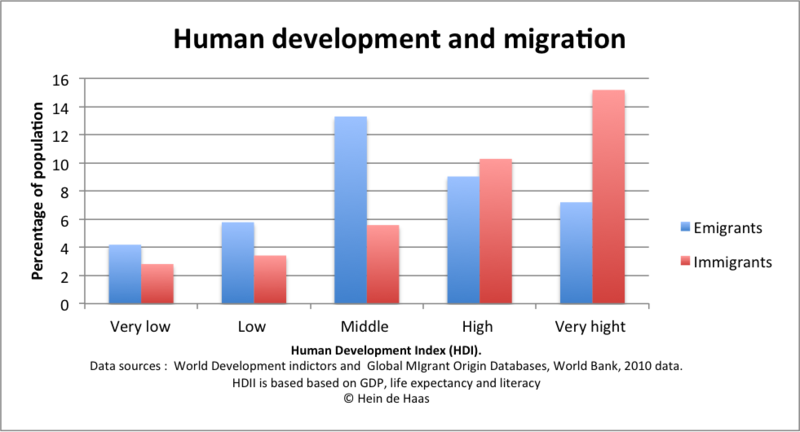 In reality, however, development initially leads to increasing levels of emigration. Confirming this "migration paradox," research has confirmed that the poorest countries exhibit a much lower level of emigration than more developed nations. Migration, after all, requires significant resources. Extreme poverty immobilizes people - they get trapped because they cannot afford to leave their homeland. This is also why the idea that climate change will lead to mass migration to the West is unrealistic. Adverse environmental change can increase aspirations to move, but it can also limit the capacity to do so. Economic growth and improved education typically increase people's capacities and aspirations to migrate. It is therefore no coincidence that prominent emigration countries such as Mexico, Morocco and Turkey are middle-income countries. 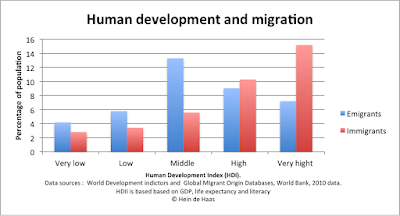 Development in the poorest countries, for instance in sub-Saharan Africa, will almost inevitably lead to more migration from those countries. Therefore, future immigrants in Europe might increasingly come from sub-Saharan Africa instead of Turkey and North Africa. 5. No, migration doesn't lead to "brain drain"
One oft-repeated argument holds that emigration causes "brain drain" - the departure of those with higher levels of education - thus undermining the development potential for origin countries. In this case, too, levels of emigration are generally simply too low to have such an effect. Research has shown that it would generally be unreasonable to blame migration - the departure of doctors, for example - for structural development problems such as inadequate health-care facilities in rural areas. Second, many developing countries face increasing levels of unemployment among university graduates. Third, the "brain drain" argument ignores the fact that migrants often invest significant amounts of money in their countries of origin. In 2015, migrants from developing countries sent some $410 billion back home, and that is just the officially recorded remittances. 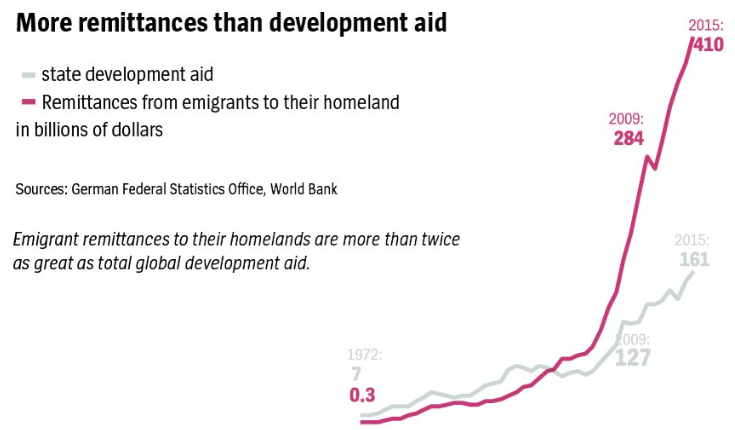 The amount is well more than 2.5 times the global total of development aid that same year ($161 billion). Such remittances improve living standards and decrease poverty levels for families and communities in origin countries. At the same time, however, it would be erroneous to believe that migrants can solve fundamental development problems such as corruption and inequality. Research shows that most migrants do jobs that local populations shun or for which they lack the skills. Furthermore, several studies indicate that while migration's effect on economic growth tends to be positive, it is rather small. Also, claims that highly developed welfare systems, such as those that exist in Germany and the Netherlands, attract more migrants than countries with a less generous social net like the United Kingdom or the U.S., have likewise never been proven. Studies do show, however, that it is predominantly businesses, the wealthy and the upper-middle classes who benefit from migration - apart from the migrants themselves. Lower income earners have generally much less to gain, or may in some cases lose out while, ironically, ex-migrants have the most to fear from new immigrants in terms of job competition. Advocates of open borders often ignore this potential for migration to increase inequality. The magnitude of migration is far too low to offset the effects of population aging. A United Nations study has shown that, to achieve such a result, levels of migration would have to reach levels that are both undesirable and unrealistic. In order to counter its aging population, this study found that Germany, for example, would require net immigration of 3.5 million people per year - 12 times higher than the annual average of 280,000 from the years 1991 to 2015. Furthermore, this argument ignores that population aging is becoming a worldwide phenomenon, and that aging societies such as China have started to become international migration destinations in their own right. The future question might therefore not be so much how to prevent migrants from coming, but how to attract them. And finally, a look at the broader picture. 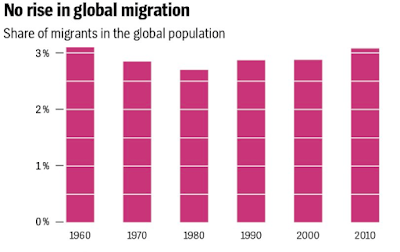 For over half a century, the number of migrants as a percentage of the world population has remained remarkably constant at levels of roughly 3 percent since 1960. Even as the number of international migrants has increased from 93 million in 1960 to 244 million in 2015, the global population has increased at approximately the same rate, from 3 billion to almost 7.3 billion. The idea of a global "refugee crisis" likewise has no basis in fact. On a global scale, refugees represent a relatively small share of all migrants. While the number of refugees decreased from 18.5 million to 16.3 million between 1990 and 2010, the total rebounded to 21.3 million in 2016, primarily as a result of war in Syria. Still, refugees only represent between 7 and 8 percent of the global migrant population, and about 86 percent of all refugees live in developing countries. Countries such as Turkey, Pakistan, Lebanon, Iran, Ethiopia and Jordan currently host the largest refugee populations. Western societies, by contrast, receive a comparatively low number of refugees, and current numbers are anything but unprecedented. Currently, about 0.4 percent of the total EU population is a refugee. That figure hovered around 0.5 percent between 1992 and 1995. The main change in global migration patterns has been the dominant direction of population movements. Whereas in past centuries, it was mainly Europeans who migrated to foreign territories (or conquered them), this pattern has been reversed since World War II. With its strong economy and aging population, the EU has emerged as a global migration destination, attracting between 1.5 and 2.5 million non-EU migrants per year. Although this sounds significant, it corresponds to between 0.3 and 0.5 percent of the EU's total population of 508 million. Furthermore, between 1 million and 1.5 million people leave the EU every year. 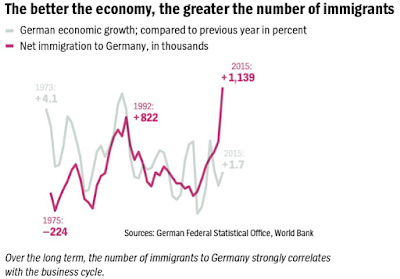 Net migration in European countries like France and Germany tends to fluctuate, as illustrated above, in parallel to business cycles, but the long-term trend does not show an increase. There is an urgent need to see migration as an intrinsic part of economic growth and societal change instead of primarily as a problem that must be solved. It is inevitable that open and wealthy societies will experience substantial immigration in the future as well, whether they like it or not. This exposes one of the paradoxes of liberalization: The political desire for less migration is fundamentally incompatible with the trend towards economic liberalization and the desire to maximize economic growth. The erosion of labor rights, the rise of flexible work and the privatization of formerly state-owned companies in recent decades have significantly increased the demand for migrant labor in Europe. The heated migration debates in Britain and the U.S. - both strongly liberalized market economies facing persistently high levels of immigration - are powerful illustrations of this liberalization paradox. As such, the only way to really cut down on immigration seems that of reversing economic liberalization and strictly regulating labor markets. That, though, could also decrease levels of wealth across the board. The question then becomes: Is that really what we want? This article is an edited version of an article originally published in German in Der Spiegel under the title Mythen der Migration and in English under the title Myths of Migration.